My adventures in Aldi wine drinking continue. 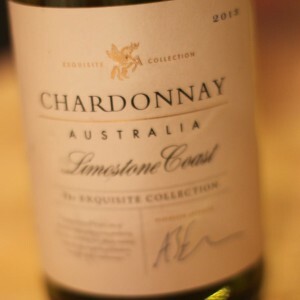 Whilst I’ve hit a couple of bum notes, the majority of what I’ve tried so far have been pretty good, so I opened this bottle of Aldi Exquisite Collection Limestone Coast Australian Chardonnay ’13 without even thinking of what my back up plan would be if it was horrid. This Chardonnay was clear and bright with a warm lemon colour. It smelled like fresh, juicy fruit salad, perhaps a little bit like tinned fruit, but not in a bad way. There’s no oak so it’s all about the fruit. It’s dry, with a medium body and alcohol level. It does taste of fruit, lots of peach and something a bit like tinned pears. I don’t mean that to condemn it, I love tinned pears, although strangely I never buy them, but instead pile my bowl with them when they’re available at hotel buffet breakfasts, always thinking “I should buy some of these when I get home”, but never doing so. The flavour lasts well, and it’s the sort of wine that does encourage you in to have a second glass. There’s a little bit of yeastiness too, again not quite bread or toast, but an interesting slight savoury note to stop the fruit from getting overpowering. At £6 I think this is a bargain, and you’d pay double that for a wine that tasted this good and came from a similarly cool zone in Europe with a more acceptable label. So far I’ve found that if you stick above the £5 mark you’ll get great wine from Aldi that would cost much more elsewhere. That’s £5 per bottle of course, I’m not encouraging you to try any 3 litre boxes for a tenner.